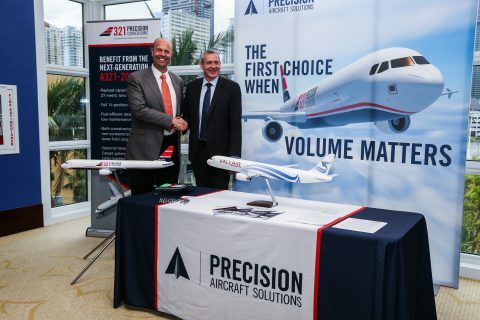 On 16 October 2017, 321 Precision Conversions, LLC (321PC), announced Vallair Solutions as the launch customer for the passenger-to-freighter conversion of Airbus A321-200 aircraft including the prototype aircraft and follow-on option aircraft. The prototype Aircraft (MSN891) was delivered by Vallair to 321PC in July. The company anticipates approval of a FAA Supplemental Type Certificate (STC) for A321-200 conversions in 2019, with EASA and CAAC validations thereafter. The Airbus A321 family includes over 1,400 aircraft already built and the A321NEO is now in production. This will generate an almost unprecedented feedstock for future conversion candidates. Vallair, already engaged in the converted cargo aircraft market, is an ideal launch customer for 321PC. They are developing a comprehensive support network for both engines and airframe components as well as MRO services to better serve the new operators of the A321-200PCF. “The A321PCF program is an exciting project and we are delighted to be the launch customer for this new freighter, our current activities and experiences generated by our engineers, both in Luxembourg and France, through the freighter conversion of other aircraft offers the right environment and facilities to gradually turn into a dedicated center of competence on this type” said Vallair CEO Grégoire Lebigot. “We believe the A321 provides significant competitive advantage over the established market competition due to its lower fuel consumption and better noise abatement levels. We are looking forward to building upon the success of this advanced aircraft”.